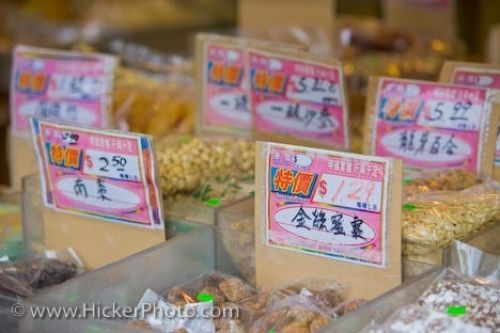 Chinatown stores display their herbs and spices for sale. The displays have prices and Chinese letters written on pink labels. Authentic Chinese food is sold in Chinatown in the city of Toronto. Toronto's Chinatown is the largest in North America. Display of authentic Chinese spices in Chinatown, Toronto, Ontario.